killed beyond doubt, writers often don't even bother to explain how they managed to survive. Even in the early days, some of the characters themselves didn't take the possibility of their own deaths seriously enough to be troubled by calling their group The Death Patrol. When war had been ravaging Europe and Asia for a couple of years and America was getting increasingly certain to become involved, the Will Eisner Studio (Sheena, The Spirit) and Quality Comics (Bozo the Robot, Marmaduke Mouse) figured something called Military Comics was likely to sell a reasonable number of copies. Eisner's studio created appropriate content, and Quality got it on the stands with a first-issue cover date of August, 1941. One of the first features created for the new title was The Death Patrol. It started when a bunch of criminals (Butch, a safe cracker; Gramps, a pickpocket; Hank, a cattle rustler; and Slick, a con artist) escaped from prison and took refuge in an airplane owned by millionaire Del van Dyne. Soon they were in the air, with Del in the pilot's seat. They would have hijacked the plane to take them somewhere they could hide out, but it was already on the way to England, where they'd be safe from U.S. law anyway. Del was planning to use his skills to assist in the war effort, and talked the crooks into joining him. That way, they could do some good and what the heck, if they got killed at least they wouldn't have to go back to jail. They could all fly, so they stole some German planes and got to work. For uniforms, they used the prison outfits they'd worn back in the slammer — even Del adopted it. Cartoonist Jack Cole crafted the first story. He'd created some pretty unfunny characters like The Claw and The Comet, but with Plastic Man (who started the same month) he was finding a niche in humor. As some surviving members of the studio at the time recalled, one of the reasons for creating Blackhawk, which also began in Military #1, was to feature a series that had a lot in common with The Death Patrol, but looked less like it was being played for laughs. Blackhawk got the cover and lead position (and kept them as long as the title ran), while Cole's creation was relegated to the back pages with Q-Boat, The Blue Tracer, Miss America (no relation) and the like. Cole stayed only three issues. With #4, Dave Berg, best known for his later work at Mad magazine, took over, and continued in the same vein until #12. After that, the series went on hiatus, with the unrelated "Atlantic Patrol" and "Pacific Patrol" alternating issues. They were back in #20, this time done by Gill Fox (later the editor of some Quality titles). Cole returned briefly, then Al Stahl (Blimpy, Flatfoot Burns) took over the series and kept it until its end. Butch was the first to make the series live up to its name, succumbing in the fourth issue. He was replaced by Chief Chuckalug, an American Indian, who brought a little racial diversity (and stereotyping) into the mix. A few others joined or were dropped over the years, including another racial stereotype, Hotentot, who came aboard when the Nazis invaded his African kingdom. When the war ended, the market for the name Military Comics shrank. The title was changed to Modern Comics with its 44th issue (November, 1945). The contents remained pretty much the same at first, but gradually switched to less military-oriented material. 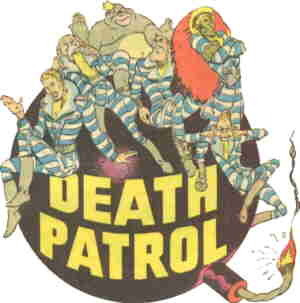 The Death Patrol lasted until #52 (August, 1946). The September issue had Bill Ward's Torchy in its place. In 1956, when Quality Comics folded, DC took over many of its properties. Some, like Doll Man and The Human Bomb, were eventually incorporated into their line. Others, like Candy and T-Man, were not. The Death Patrol was among the latter. Text ©2007-10 Donald D. Markstein. Art © DC Comics.